At Freedom Plaza, walk through a giant-sized map of Pierre L’Enfant’s original plan for the Federal City. The Plaza is an open square on Pennsylvania Avenue in Washington DC that has long served as a popular spot for civic events and political protests. Seen in Dan Brown’s The Lost Symbol and as a main gathering point of the Occupy protest movement, Freedom Plaza is a both a hotbed of past cartography and those trying to redraw the map. 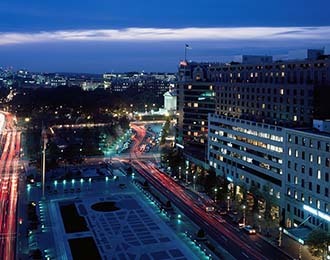 Located at 14th Street & Pennsylvania Ave NW.